Alejandro will have 32 candles on his birthday cake this year. After a successful return to professional racing this season [until he was felled by a bidon! – Ed], following 20 months on the naughty step, there was only one question on everyone’s lips: has he, or hasn’t he? We’re not talking blood bags, pet dogs and EPO here: no, nothing so trivial. The question on everyone’s lips was whether or not Alejandro has had a hair transplant? As evidence, I proffer the fact that he’s currently co-habiting with a lady he met down the local trichology clinic and these ‘before’ and ‘after’ photos which I think prove quite conclusively that Alejandro is indeed guilty. Or at least I thought so until I saw his photograph in L’Equipe last Thursday, where his hair looked much more like the ‘before’ photograph. So, now, frankly I’m not so sure! I believe I’ve previously mentioned that I’ve met his Dad and older brother, both of whom are as bald as coots. So, if he has had some treatments, is Alejandro wasting his Movistar money? Will he be able to stave off the inevitable? Well, maybe! According to recent reports, successful use of stem cell therapy could cure baldness. A Japanese research team have managed to grow hair on the back of a bald lab mouse which could eventually be adapted for use in humans. The team used stem cell cultivation to create hair follicles from scratch. 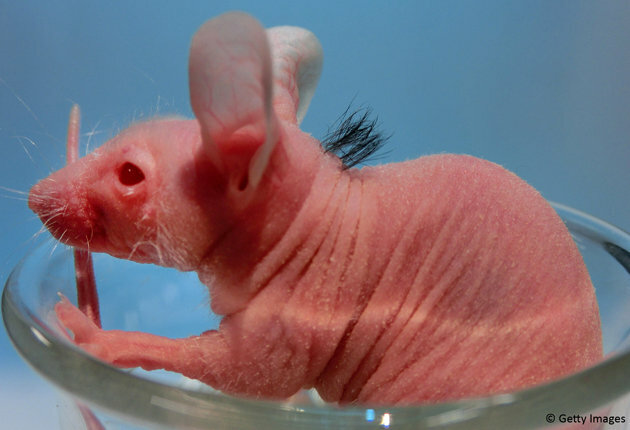 These follicles were implanted into hairless mice who then grew hairs. The next step is to implant the newly created follicles into a human head in order to win the battle against balding. It’s believed the technique may also allow men to re-grow hair in their original colour, even if they’ve already started to go grey. Could this be the solution to Valverde's hair issues? The researchers from Tokyo University believe a cure for baldness could be engineered within three years. It will be an expensive treatment, however, and they believe it might be more useful in reconstructive situations where traditional hair transplant operations aren’t possible. But there’s more research to be done, as the team do not yet know if it would be possible to recreate an entire head of hair. In this study, the hairs had to be implanted one at a time, which is fine on a mouse but a rather different proposition on an entire bald head! GreenEDGE completed a perfect debut, as the latest addition to the UCI ProTeam family claimed overall victory at their ‘home’ race of the Tour Down Under. Simon Gerrans won the event for the second time, having previously won it with AG2R in 2006, while Andre Greipel stormed to his third stage victory to underline his position as arguably the greatest threat to the pre-eminence of Mark Cavendish in the sprints.